Info:Gin is the Drink de Jour! Gin is the hot drink trending now. Hipster drinkers and todays mixologists are creating the revival! In fact, gin is picking up from where vodka left off and boutique gins are trending so much right now, there is even a sort of gin snobbery today! Gin goes way back. It was the spirit in the Prohibition-era America days, but after the speakeasy days were done, mid-century vodka trend took over. Gin is the star of classic drinks like the Gimlet but it’s not been a cool drink to consume - until now. All along many top seasoned mixologists felt that a Martini made with gin, not vodka, is much better. Today there is even a sort of backlash against Vodka in many places. If you haven’t had gin in a while - it has a distinctive smell of juniper, as all gins are juniper berry-based and have botanicals superimposed. Bartenders are really driving the trend right now. They think gin is great to play with and manipulate. They call it rich and diverse. It’s usually made from grain with complicated botanical flavors overlaying predominant juniper notes. Meantime…gin’s revival has led to an explosion and created the modern ‘micro-distillery’ trend. That includes Sipsmith and Sacred in London as “craft distilling” is now trending that its taking over taking over from the craft beer trend. A micro distillery is a small often boutique distillery created to produce beverage grade alcohol in small quantities. The micros have been established in Europe for many years, either as small cognac distilleries providing product for larger houses or as distilleries of single malt whiskey originally produced for the blended Scotch whisky market but whose products are now sold as niche single malt brands. Micro distilleries are big in London, Switzerland and South Africa. Jumping on the trend are the mega distillers too! Many mega distillers have opened their own micro’s - such as The Makers Mark Distillery and the Buffalo Trace Distillery - that are now producing specialty bourbon brands with small stills. The trend is so hot that other mega distillers are expected to do the same thing such as Bacardi and Pernod Ricard. One micro distillery gin to win a big award recently from The American Distilling Institute - was a gin from Montreal, Canada. The winner was: Madison Park London Dry Gin. It was honored with the gold medal, named best of category and best of class for 2015. 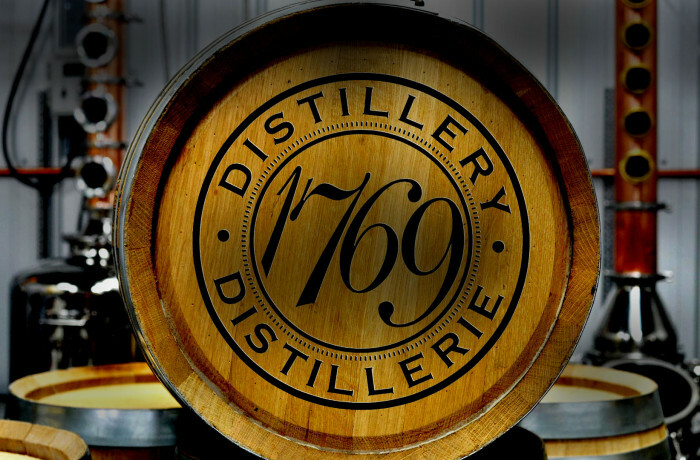 Called 1769 Distillery Inc., co-founded by the husband and wife team of Andrew Mikus and Maureen David (and in full disclosure, happens to be my cousin) entered their gin in the annual craft-the gin could be sold - it won! Their micro distillery is a labor of love for the couple who left the lucrative TV business to do start a gin business. Mikus says even though he was worked on the production side of TV shows such as CSI as a partner for 20 years in a TV and film post-production company called Station 29 (which does editing and audio synchronization) he always knew he would open a company one day that made something. Gin? Did he know it would be gin? Well, not quite. This TV pro had a love for the process but his interest in distilling grew over the years so much that Mikus decided to study distilling on the side. He is now a certified master distiller after completing courses in Washington state and South Carolina. To make things livable with opening such an ambitious business at mid life - he and his wife have their distillery in the same building that houses Station 29 - making running back and forth easy for Mikus with two full time jobs now. He and David, a former TV producer who used to travel the globe with a syndicated TV show ‘Travel Travel’ and directed newscasts and talk shows for the CTV Network, both always had a passion for “craft” distilling when they travelled. David is now the company president and takes care of PR, marketing, sales and administration. Mikus handles production. The gin sells for $39.00 CDN a bottle. They plan to expand to vodka and whiskey in the future but the whiskey will take a while because it takes three years to age, while gin and vodka take just one month. Meantime - the two can’t sit still so they came out with yet another product (a very Canadian thing to do…) they are aging maple syrup. Not just any maple syrup - this syrup is aged in “bourbon” barrels to create a highly select product that is now available in some specialty stores across Canada. The maple syrup is quite exclusive (and quite pricey - $30-$32 CDN per bottle) but taste buds are said to be loving it and some chefs are now including it their repertoires. Down the road, the couple hopes to sell up to 60 thousand units a year of the spirit and they plan to expand Ontario, USA and Europe. As they wait to hit store shelves they can now bask in the fact that gin is the Drink du Jour!